When I was a mental health therapist, I used this phrase a lot. Helping individuals overcome emotional distress required learning, and it required the sort of learning that involved individuals in experiences that brought about life change. Telling and showing people the steps to change just wasn’t enough. I left my 20-year career as a mental health therapist a few years ago, choosing a career of creating art full time instead. Lately, however, the teacher in me has re-emerged. Through the ArtsinStark SmArts program and the Massillon Museum Artful Living program, I have been visiting a variety of classrooms across Stark County Ohio, bringing Arts Integration programming to local schools. Arts Integration is not traditional arts education. Instead of teaching Art as a discipline of its own, Arts Integration uses creative activities to enhance learning in other academic disciplines such as math, science, social studies, language arts, and other subjects. By involving students in creative activities around other learning concepts, they develop a deeper understanding of the traditional academic curricula, and their interest is piqued so that they have a desire to explore further learning. It is not just another clever approach to teaching. As concerns rise about academic decline among American youth, we need to find ways to educate students in more effective and meaningful ways. Also, creative exploration is becoming essential to future career success for today’s students. Jobs that once required linear thinking and rote activity have either gone overseas or have been replaced by machines, leaving non-creative thinkers with few career options. We need to be teaching youth to think creatively as they learn academics, or they will be unprepared for their role in the future workforce. Research has shown that students whose educational experiences include arts integration tend to perform better on many levels, and they demonstrate more confidence and pride in their education. It makes sense when you think about it. Showing 5th grade social studies students photos of a Mayan mural in a book or on a classroom smart board might intrigue a student or two, but the interest is likely to be passing. Involve the entire class in drawing Mayan images to create their own mural, however, compels them to: explore the purposes behind the stylistic designs used by the Mayans; discuss the development of early civilizations depicted through their enduring creative arts; and ponder the importance of ancient history to present day culture. Which sounds more educational to you? Early learning, too, is enhanced through artistic experience. Many preschool students have yet to develop language and fine motor skills that are needed as they advance into more challenging educational concepts, and the arts can be an important learning tool for them. Very simple arts projects built around preschool objectives can help them learn essential concepts that help them build a foundation for future learning. Art and creativity in academic programming is very important. Integrating the arts into daily school programming teaches children to think in creative ways beyond the simple remembering of facts and figures. We want children to be able to think, and not just be able to recite information on tests, yet our school curriculums seem to have taken to doing just the opposite in recent years. The politicized atmosphere around public education has led to the most creative and effective programming in schools being pushed out. Arts programming often is the first to be cut when school funding is scrutinized. I am of the opinion that arts education as a separate discipline is an important element of all public and private schools. All children need to learn about the arts to make their education complete and well rounded. I also am of the opinion that the arts should extend beyond the art room and enter into the math, science, social studies, etc. classrooms to enhance learning in all disciplines. Most schools do not have either. We need to change that. I am glad that I live in a community that recognizes the need for supplementing the public school system with auxiliary services in the arts. I wish that auxiliary services were not needed and that regular curricula included arts integration. But that is not the world I live in presently. Because of donations and grant funding, the ArtsinStark SmArts program and the Massillon Museum Artful Living program have been able to hire Teaching Artists to bring Arts Integration to classrooms of all levels across Stark County. I consider it to be a privilege, honor, and huge responsibility to be a part of both programs. I have learned much, myself, through working with some fabulous teachers, administrators and arts professionals. We all learn through the process of teaching tomorrow’s leaders, and that brings hope for a brighter future for all. As I have worked with the aforementioned 5th grade social studies class, I have learned about the development of civilization in general from both a youthful and adult perspective. Looking at the rise of ancient civilizations through the eyes of youngsters learning history for the first time, and looking back as a middle aged woman, pondering the cultural shifts occurring in our modern world, has been very intriguing for me. It is time that we very boldly recognize that art is not just for artists. Arts programming is not simply for preparing artists for careers in the arts. The arts are for preparing ALL students to think in ways that can better the world in which they live. The arts have been the mark of history for centuries, and they are the light of our future. How can we ensure that creative programming is a part of all schools that educate our most precious resource – our children? How can we take that extra step to involve children in their education so that they can learn? “If you become the change you want to see, you change.” ~ Melissa Etheridge from What Happens Tomorrow? Spending time with Lynn Haigh, coordinator of the Pawpawty, Dr. V. from Pawcurious, Dorian Wagner from Your Daily Cute, Caroline Golon, staff to Romeo the Cat and BlogPaws cofounder, and Jane Harrell from Petfinder last week at BlogPaws was amazing in and of itself. Being a part of the “Be the Change” movement that they unleashed at the conference, however, has been life-changing. Not only has the effort helped to re-commit me to giving back to my community and to animals in need, it has broadened my network of people who are kindred spirits across the world. Why does an artist keep writing about something that seems sorta non-art related on her art blog? Because life changing experiences are at the heart of my art, and sharing a love of animals with others in such a deep and meaningful way inspires and motivates my creativity. I came away from BlogPaws not only with a motivation to do things for animals. I came away with a renewed and invigorated desire to create. And one of my creations is helping animal rescue organizations. One of the neat things about the “Be the Change Blog Challenge” is that I have discovered new blogs that I had rarely or never visited before. One of these Blogs is Pawcurious, written by Dr. V., a veterinarian from San Diego. I got to meet Dr. V. at BlogPaws, and she is a very generous and interesting woman with a great sense of humor. I have been poking around her blog a bit and have found her articles heart warming and full of great insights. I rather like the fact that a doctor who is highly educated in the sciences realizes the value of the arts as a part of a child’s education. Dr. V. was lamenting about how schools will spend a fortune to send kids on entertaining pseudo-educational trips to Sea World, yet not spend a dime on arts curricula that would be so much more enriching. People think that an arts education only trains talented youth for arts related careers. In truth, it does so much more for all children, regardless of their specific talents. Arts education inspires children to think creatively. It develops character; it motivates children to explore ideas beyond a television set or computer game set; and it stimulates creative problem-solving. I am convinced that the arts-rich elementary education that I and my brother and sister received in Liberty, Mo. was responsible for not only my own artistic pursuits. It led my brother to become a pioneer in computer systems programming and my sister to become one of the best teachers in the Kanawha County, WV school district. Arts eduction apparently helped DR. V. become a great veterinarian, and it helped her become a great writer who educates and inspires through her blog. Here is something few people know about BlogPaws. From the very beginning, the co-founders wanted to include an arts focus to this very non-arts event. Why? Because they realized that art completes us. It colors our world. It makes things so much more meaningful. It inspires and moves us, making real-world experiences a part of our soul in a much deeper way. 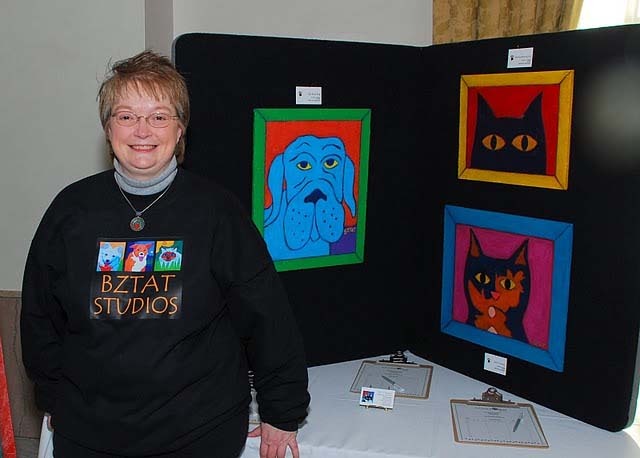 The PawsArt Exhibit/Silent Auction was a part of the planning from the very beginning of BlogPaws in order to inspire the creativity of the participants. Seeing the incredibly moving video created by Lynn Haigh, arguably one of the finest creative efforts seen by many in a long time, has inspired a movement that has exceeded the expectations of a very ambitious crowd. Would it have happened had we not had the “art” to make it real for us? We are already talking about how the arts will be incorporated into the next BlogPaws event. Do you have any ideas for us? Please leave a comment below if you do. How have you changed or been changed by art and/or by animals? How are you becoming the change that you want to see?